This feature is all about proposals. However, there’ll be no mention of engagement rings and no one needs to get down on one knee. Instead, we’re talking about how best to pop the question to your bride tribe. Your bridesmaids will play a big part in your day and you’ll definitely want your best girls by your side. So, why not propose to them in style? 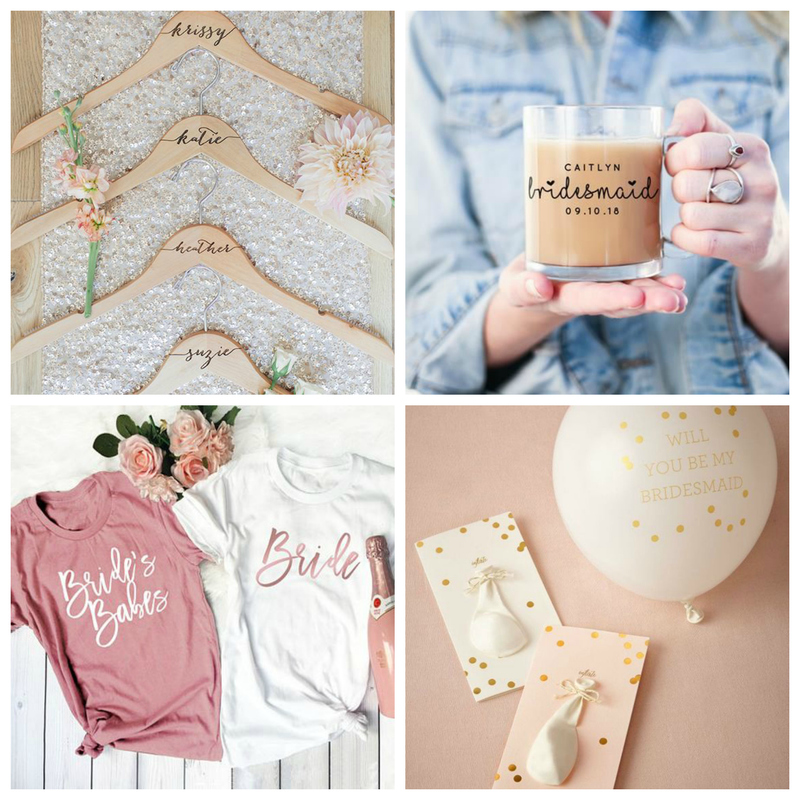 Here are 14 great ideas for fab bridesmaid proposals. 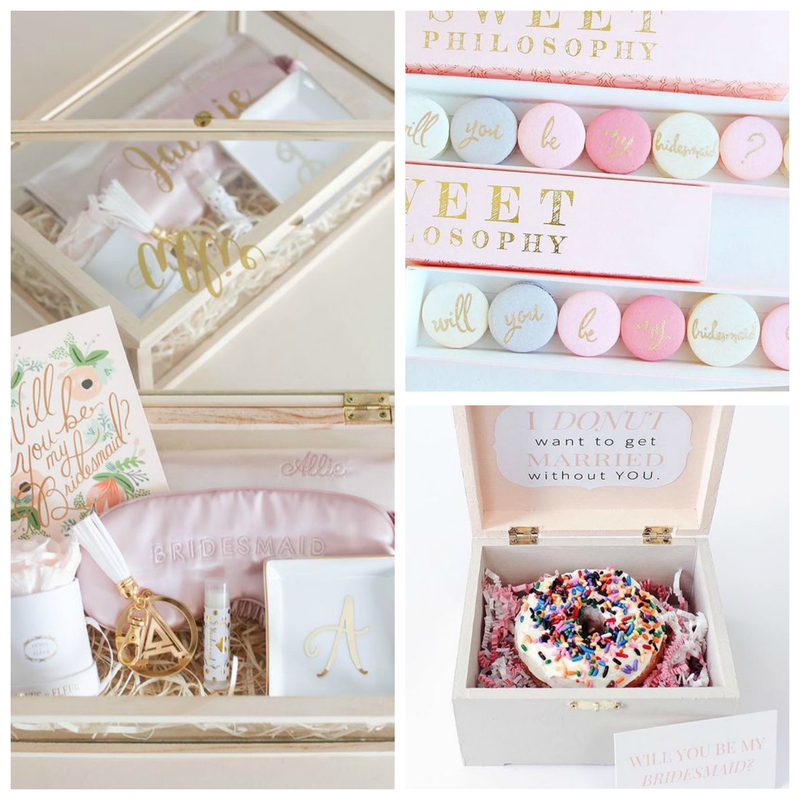 Bridesmaid kit boxes are a great way to pop the question. You can buy them ready made or create your own so that they’re full of everything your maids will need for the day. 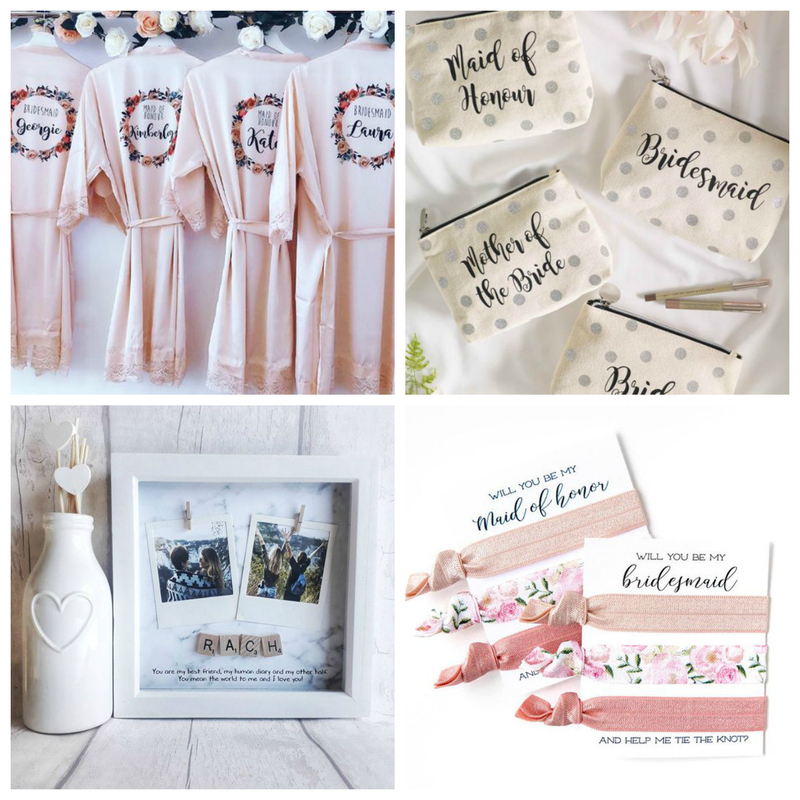 Whether you choose treats or practical goodies, your bridesmaid boxes will be a brilliant gift for your girls. Everyone loves sweet treats so why not propose with some fancy confectionary? Personalised macarons or biscuits are always yummy, or you could opt for a doughnut instead. The more sprinkles the better! Why not give your girls something special to wear with a gorgeous piece of jewellery? Knot-shaped or ring-shaped earrings, necklaces and bracelets all suit the wedding theme and, let’s be honest, we all love a new piece of jewellery! 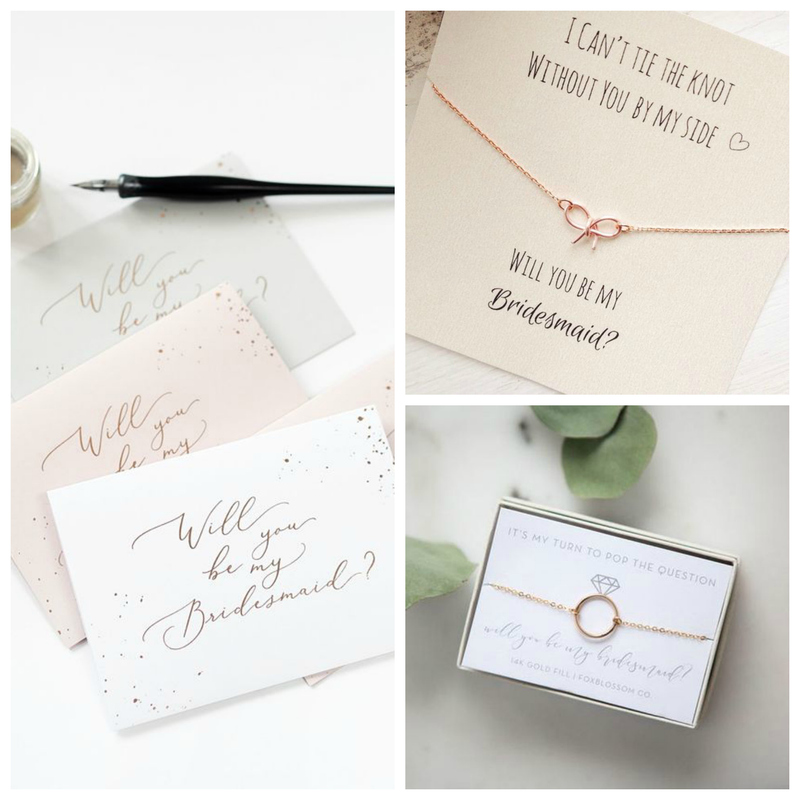 A handwritten note inside a beautiful card can be really meaningful so propose with words and tell your bridesmaids just how much they mean to you. You could even give them a hint of what’s to come by choosing a card that works with your wedding colour palette. Your bridesmaids are sure to look fantastic on your big day and no doubt they’ll be wearing something very special. Gift them a very special hanger so that they can keep their gowns in tip-top condition before the day. These also look ace in wedding day photos too. If your bridesmaids love their caffeine hit, why not gift them a mug that asks the question for you? If you personalise it with your wedding date, they’ll have their save the date to hand at all times. A fabulous bridesmaid t-shirt will definitely make your maids feel as if they’re part of the club from the word go. Wear them on your hen weekend or on the morning of your wedding, it’s up to you. It doesn’t matter how old you get, balloons always bring the party vibe. Propose with a balloon that has to be popped so that your bridesmaids are showered in confetti and a handwritten note asking them to be by your side on the big day. Bridesmaid robes are another great gift that your maids can wear on the morning of your wedding. Luxurious yet practical for wedding day hair and makeup, bridesmaid robes are really popular, and with good reason. Another useful but glam gift is a bridesmaid pouch or makeup bag. Your bridesmaids can keep their on the day essentials with them (and even carry a few for you!) and you can be sure these will also be used once the day is over. Show your bridesmaids just how special they are to you by creating a frame featuring old photos of you both. Proposal gifts don’t get more personal than this. Fab and fun hair ties are an inexpensive yet brilliant proposal gift. Your maids can wear them on your hen weekend so everyone knows that they’re your wedding day VIPs. Candles are a delightful gift at any time and they’re a lovely luxe proposal gift. Choose your favourite fragrance or opt for a personalised, strictly limited-edition version for your lucky maids. 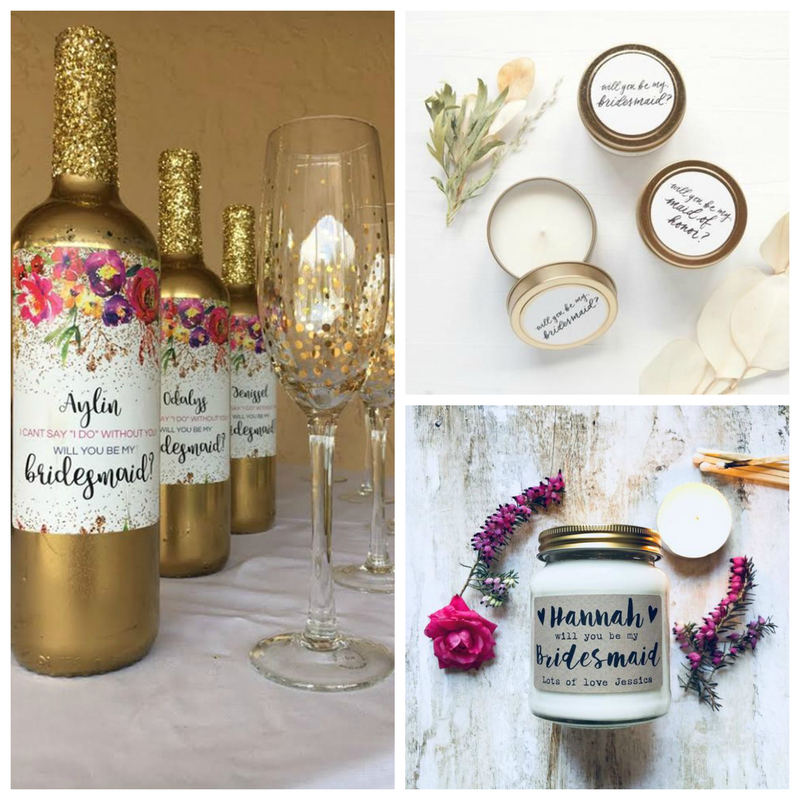 Finally, if you’d like to celebrate your bridesmaid proposal with a glass of something sparkly, why not design a custom label to create your own vintage bottle from your favourite tipple. Add a gorgeous glass into the gift box if you want to really show your maids the love. Why not bring your bridesmaids to our upcoming Open Days? Our parks will be open on 19thMay if you’d like to look around our woodlands and find out more about weddings at GreenAcres. We’ll also be offering a 10% discount on all wedding packages over £1000 that are booked on the day so add the date to your diary now. In the meantime, if you’d like a brochure or more information, do get in touch.